You've heard of Thanksgiving stuffing, Thanksgiving pumpkin pie and Thanksgiving turkey. But have you heard of Thanksgiving popcorn? Of course you haven't. That's because I just created it. Why "Thanksgiving" popcorn? Read on. I handed Jeff a bowl of popcorn and said, "Here, try this." He ate a couple of handfuls and said, "This is the best popcorn you've ever made." He took another handful and tossed it in his mouth. "Oh, yeah. This is definitely the best. What's it called?" he asked. "I don't know. I can't think of a name I like," I said. "You should call it Thanksgiving popcorn. It's got all the flavors and smells of Thanksgiving," he said. And that, my friends, is how today's popcorn got its name. Hmmm... I wonder if I can get my own Wikipedia entry for it. 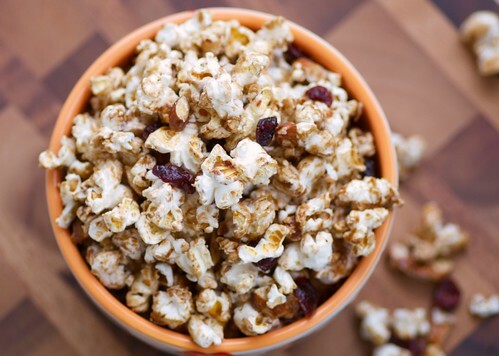 This popcorn is a fun, kid-friendly appetizer or dessert to serve on Thanksgiving Day and pairs deliciously with mulled apple cider. If you really love pumpkin pie spice, then use it in place of the apple pie spice and call it "Pumpkin Pie Popcorn." 1. Preheat oven to 325 degrees F. Coat two large rimmed baking sheets with cooking spray or aluminum foil. 2. Pour oil in a large saucepan over high heat and cover. After about 1 minute, listen for the shimmering oil as it heats up, then drop a couple of kernels in the pan. When they start sizzling and spinning, the oil is ready. Add remaining kernels. Cover the pan, and give it a couple of shakes so the kernels get coated with oil. Now listen for the popping. Once it really starts popping quickly, listen carefully. Remove the pan from the heat once the popping slows down to every few seconds, or it could burn quickly. Pour popcorn into a big bowl coated with cooking spray, and add nuts and dried cranberries. 3. In a small saucepan over medium heat, bring butter, maple syrup, brown sugar, salt, and black pepper to a boil. Cook 1 minute. Add apple pie spice. Lower to a simmer for 2 minutes. Cool for 5 minutes. Pour syrup over popcorn and nuts, stirring to coat. Spread the popcorn mixture on to the prepared baking sheets. Bake for 10 minutes. Remove from oven and cool. Break into small clusters. This popcorn sounds dangerously delicious. Yes it does seem to scream Thanksgiving and holidays and comfort foods. Holy crap, that looks crazy good. Me want. Now. TG popcorn looks terrific - love the name, the story and your recipe! Well you may not be able to bottle up thanksgiving and sell it in a can, but you can certainly pop it out of a kernel! Good stuff. Holy popped kernel Batman! That's amazing. Great idea with the apple pie spice (and thanks for the shoutout)! Oh yum! What a great idea! Since popcorn is a whole grain, I wouldn't feel guilty for eating this--perfect! This sounds fantastic. And I love that you added pepper to the sweet mix! Yum! Forget the turkey! I'm coming to your place! I will make for one of my contributions to Thanksgiving at a friends house. OHHH my! A MUST try!!! val-That's what I like to hear! dessertfortwo-I like the way you think. countrygirl-It's a delicious foil to the sweetness. The pepper is perfect! That sweet/spicy combo just works. This sounds like it become addictive. I have popcorn in the pantry. Will be trying some of this soon! I'm certainly "giving my thanks" to you for this lovely popcorn idea, Susan. And my daughter's going to be thrilled! Made this for a Thanksgiving munchie - people fought over it! It is a new tradition in my family! I am actually making more tonight, so we can eat more standing in line tomorrow - to see Santa. Thank you! Bonus- my 3 year old doesn't like cranberries or nuts, so i get all of the GOODIES!